The NJHS chapter adviser is the primary facilitator of all chapter activities and is a key factor in determining a chapter’s success. Appointing a capable, dedicated individual for the job is one of the principal’s most important NJHS-related responsibilities. Chapter advisers are appointed yearly, must be members of the school faculty, and may be reappointed to serve additional terms. 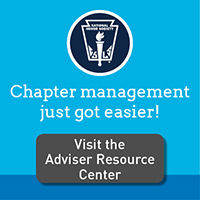 Here is a list of chapter adviser functions to assist you in your selection process. Principals have the option to appoint multiple advisers; however, one individual should be appointed as the primary adviser for the entire chapter’s account. The primary adviser can manage all online features, including billing, and can add or remove advisers.